TARTAGAL - Residents of this city's Villa Guemes sector claim having witnessed unidentified flying objects this past Saturday. Area residents point out that strange lights appeared in the sky, executed maneuvers and later vanished into infinity. UFO sightings in Salta have become ubiquitous and have attracted the attention of some of the world's foremost experts. 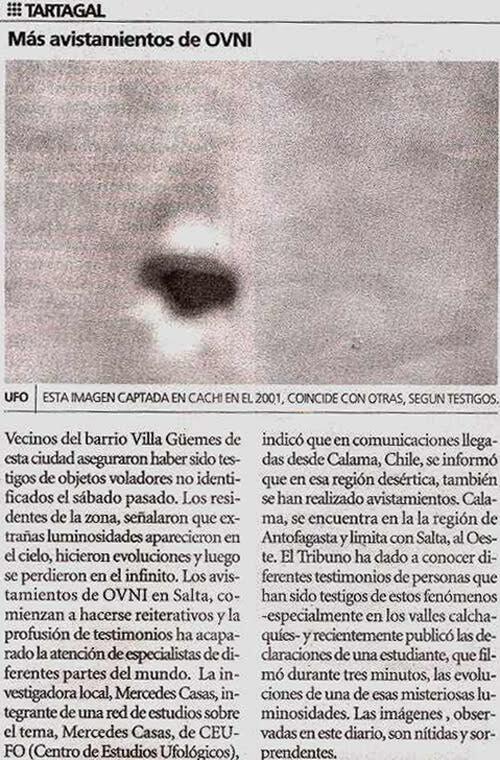 Local researcher Mercedes Casas, who belongs to a network devoted to the study of the subject (CEUFO-Centro de Estudios Ufologicos) pointed out that sightings had also been reported in the desert region over Calama, Chile. Calama is in the Antofagasta region and borders with Salta to the west. El Tribuno has disclosed a number of accounts provided by residents of this area--particularly in the Chalchaquí valleys --and recently published the testimony of a student who filmed the maneuvers of one of these strange lights for more than three minutes. The images, shown in this newspaper, are clear and startling. Translation (C) 2002. Scott Corrales, Institute of Hispanic Ufology. Special Thanks to Mercedes Casas.